A contemporary of Stirling Moss, Peter cut his single seater teeth in the rough and tumble of 500cc F3 racing before partnering Moss in the tail-end HWM team for the 1952 season. 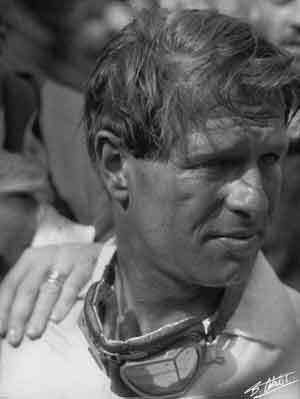 After that he drove briefly for BRM and Vanwall before signing up with Ferrari for 1956. The following year he was joined at Ferrari by Mike Hawthorn and the two men became the closest of friends, indulging in outrageous pranks while at the same time deriving huge fun from their motor racing. They nicknamed each other "Mon Ami Mate" after a contemporary newspaper cartoon strip character. In 1958 Peter emerged as a serious Championship contender, winning the British Grand Prix at Silverstone. Yet the Ferrari Dino 246s were fighting against the odds against Tony Brooks's Vanwall at the Nurburgring a fortnight later and, in his enthusiasm to keep up, Collins lost control and slid off the circuit. He died later that evening from head injuries.